Marquette University university announced that it will not use its campus facilities “vacant or otherwise” to provide shelter to Milwaukee’s homeless population throughout the winter. The announcement came after Milwaukee Aldermen Bob Donovan and Mark Borkowski held a news conference in proximity to a homeless encampment to urge Marquette to open the city’s former Ramada Hotel, which is now owned by the university, to those without a place to live, according to ABC-affiliate WISN12. “A lot of folks will say, ‘Well, why don’t we use all of the vacant buildings that the city owns to house the homeless?’ In theory, that’s a good idea. In practice, it has many, many challenges. A lot of these properties are vacant for a reason. They’re uninhabitable,” said Milwaukee Alderman Bob Bauman. 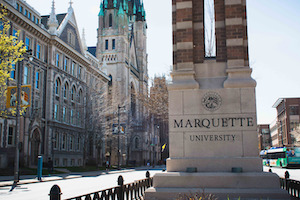 The responsibilities that come with opening and operating a homeless shelter are not responsibilities Marquette can add to their plate, university officials said in the announcement, adding that the institution is involved with several homeless outreach programs and works with city and county organizations to try to decrease the local homeless population.